As a global or SharePoint admin in Office 365, you can let your users create and administer their own SharePoint sites, determine what kind of sites they can create, and specify the location of the sites. By default, users can create communication sites and Office 365 group-connected team sites. Some functionality is introduced gradually to organizations that have signed up for the Targeted release option. This means that you might not yet see this feature or it might look different than what is described in this article. Disabling site creation for users does not remove their ability to create Office 365 groups or resources, such as Microsoft Teams, which rely on a group. 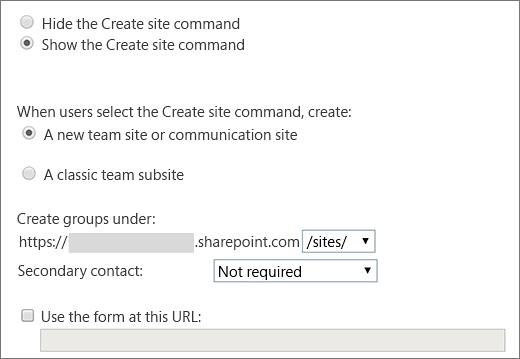 When an Office 365 group is created, a SharePoint site is also created. To restrict creation of Office 365 groups and the resources that rely on groups see Manage who can create Office 365 Groups. In the left pane of the new SharePoint admin center, select Settings, and then select Site creation. 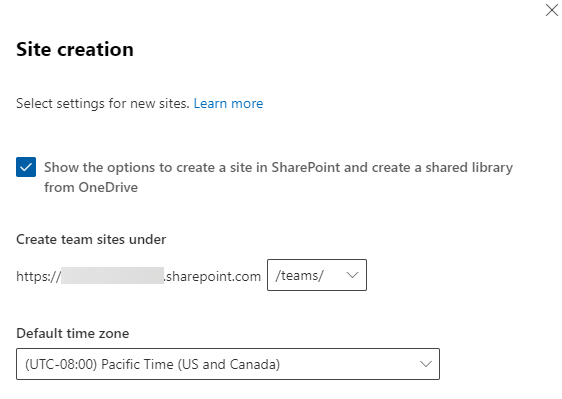 Select to create Office 365 group-connected team sites under /sites or /teams, select the default time zone and storage limit for new sites, and turn Let users create new sites On or Off. Under Site Creation, select to show or hide the Create site command. If you select Show the Create site command, specify the type of site that users can create. To allow only a select set of users to create groups, use the PowerShell cmdlet GroupCreationAllowedGroupId. For info about this cmdlet, see Azure Active Directory cmdlets for configuring group settings. A new team site or communication site: Select to create the group-connected team sites under (/sites or /teams) and whether a secondary contact is required. To let users create sites from a custom form you've created, enter its URL in the Use the form at this URL box. When users select which type of site they want to create, they'll be able to access the form by clicking "See other options." A classic site: Use this option to allow users to create only default classic sites or sites from your custom form. Specify where sites are created, and whether a site classification or secondary contact is required. To specify a custom form, enter the URL for the custom form in the Use the form at this URL box. For info about classifying Office 365 groups, see Manage Office 365 Groups with PowerShell. Under Subsite Creation, specify whether users can create subsites for classic sites, all sites, or not at all. This setting controls only the New menu on modern pages. It doesn't prevent users from creating subsites through classic pages.